We present a technique for contactless micromanipulation of vesicles, using localized calcium ion gradients. Microinjection of a calcium ion solution, in the vicinity of a giant lipid vesicle, is utilized to remodel the lipid membrane, resulting in the production of membrane tubular protrusions. Ali Doosti, B., Cans, A. S., Jeffries, G. D., Lobovkina, T. Membrane Remodeling of Giant Vesicles in Response to Localized Calcium Ion Gradients. J. Vis. Exp. (137), e57789, doi:10.3791/57789 (2018). In a wide variety of fundamental cell processes, such as membrane trafficking and apoptosis, cell membrane shape transitions occur concurrently with local variations in calcium ion concentration. The main molecular components involved in these processes have been identified; however, the specific interplay between calcium ion gradients and the lipids within the cell membrane is far less known, mainly due to the complex nature of biological cells and the difficultly of observation schemes. To bridge this gap, a synthetic approach is successfully implemented to reveal the localized effect of calcium ions on cell membrane mimics. Establishing a mimic to resemble the conditions within a cell is a severalfold problem. First, an adequate biomimetic model with appropriate dimensions and membrane composition is required to capture the physical properties of cells. Second, a micromanipulation setup is needed to deliver a small amount of calcium ions to a particular membrane location. Finally, an observation scheme is required to detect and record the response of the lipid membrane to the external stimulation. This article offers a detailed biomimetic approach for studying the calcium ion-membrane interaction, where a lipid vesicle system, consisting of a giant unilamellar vesicle (GUV) connected to a multilamellar vesicle (MLV), is exposed to a localized calcium gradient formed using a microinjection system. The dynamics of the ionic influence on the membrane were observed using fluorescence microscopy and recorded at video frame rates. As a result of the membrane stimulation, highly curved membrane tubular protrusions (MTPs) formed inside the GUV, oriented away from the membrane. The described approach induces the remodeling of the lipid membrane and MTP production in an entirely contactless and controlled manner. This approach introduces a means to address the details of calcium ion-membrane interactions, providing new avenues to study the mechanisms of cell membrane reshaping. The role of calcium ions within biological processes, specifically their involvement in signaling, cell division, and membrane fusion, is the focus of many mechanistic studies1. The intracellular cytoplasmic calcium ion concentration is on the order of 100 nM, while the calcium in organelles, such as the endoplasmic reticulum, secretory vesicles, and mitochondria, reach levels up to tens of millimolars in concentration. This creates steep calcium ion concentration gradient orders of magnitude across intracellular membranes2,3,4,5,6,7,8,9. The extracellular calcium ion level is around 2 mM and hence, the variations of calcium ion concentration occur at both the extracellular and intracellular levels. Furthermore, recent studies provide evidence that intracellular calcium ion signaling events and neuronal activity can occur under the conditions of local fluctuations of extracellular calcium ion concentrations, indicating the importance of synchronized intra- and extracellular calcium ion variations10. Aiming to understand the interplay between calcium ions and biological membranes, a synthetic approach in which native cell membranes are replaced with lipid bilayer vesicles has been successfully implemented. Exposing vesicles to calcium ion solutions leads to changes in lipid head groups and hydrocarbon chain packing, increased membrane tension, and vesicle aggregation, as well as the segregation of lipids and membrane phase transition11,12,13,14,15,16. The properties of the lipid membranes upon exposure to calcium ions have been investigated using such experimental techniques as X-ray, 1H-NMR, and spectroscopic or thermodynamic studies11,16,17,18. In these studies, the membrane composition is often tuned to resemble native cell membranes and contains such physiological lipids as phosphatidylcholine (PC), phosphatidylethanolamine (PE), and phosphatidylserine (PS). PS is especially important in artificial vesicle preparation because it is an essential component in many cellular processes including intracellular membrane trafficking, exocytosis, and apoptosis19,20. The size of synthesized lipid vesicles often ranges from nanometers to several micrometers. Among different vesicle preparations, giant unilamellar vesicles (GUVs), which are several to tens of micrometers in diameter, are of particular importance due to their relatively large size, closely resembling the dimensions of individual cells21,22,23. The available surface area of the GUVs enables the effect of local chemical gradients on membrane biophysical properties to be studied. By exposing only part of the membrane surface to the external stimuli, the membrane dynamics can be more closely investigated. For example, it has been shown that localized application of chemical or pH gradients to the surface of GUVs leads to the formation of tubular protrusions, which were not observed at bulk exposure24,25. The observed differences in membrane behavior call for further method development of single-vesicle interrogation schemes to gain some insights into the mechanisms of cell membrane remodeling. Building upon the methods of microinjection and micromanipulation from the early 1900s26,27, in connection with more recent advancements of single-vesicle manipulation schemes from the 2000s23,28, this article presents an approach in which membrane remodeling and formation of membrane tubular protrusions (MTPs) in the GUV membrane are generated in response to local application of calcium ions. Our approach utilizes a vesicle complex consisting of a GUV connected to a multilamellar vesicle (MLV) as a biomimetic membrane model system (Figure 1A). The MLV is required as a lipid reservoir for the complex to supply lipid material to the GUV during exposure to a calcium ion gradient. This connection allows the complex to compensate for the increase in membrane tension during induced remodeling and shape transitioning of the GUV membrane and provide lipids for MTP growth. Furthermore, the MLV facilitates the surface immobilization because its mass is larger compared to that of the GUV. The GUV-MLV complexes, when immobilized onto a solid substrate, have been previously used for producing nanotube-vesicle networks, studying polymer-membrane interaction, and mimicking the late stages of exocytosis29,30,31,32,33. Previous protocols utilized soybean polar lipid extract (SPE) to prepare GUV-MLV complexes28. The SPE consists of a mixture of phospholipids that include PC (45.7%), PE (22.1%), phosphatidylinositol (PI, 18.4%), phosphatidic acid (PA, 6.9%), and a mixture of other lipids (6.9%). In our protocol herein, the SPE mixture is doped with 20% of 1,2-dioleoyl-sn-glycero-3-phospho-L-serine (sodium salt) (DOPS) to mimic the inner leaflet of the cell plasma membrane. An additional 1% of ATTO 488-1,2-dioleoyl-sn-glycero-3-phosphoethanolamine (ATTO488-DOPE) is used to stain the lipid bilayer to enable monitoring of the membrane remodeling using fluorescence microscopy. The GUVs have symmetric lipid composition across the bilayer and are locally exposed to 5 mM concentrations of calcium chloride (CaCl2). Such experimental conditions, with an elevated calcium ion concentration, also mimic the outer membrane leaflet of apoptotic cells, where the PS molecules are expressed34. The formation of the GUV-MLV complexes requires the use of a modified rehydration-dehydration method initially developed by Criado and Keller35. The vesicle preparation protocol includes the formation of a dry lipid layer, which is then used to form small vesicles in solution. This solution is then dehydrated and rehydrated to form the final GUV-MLV complexes. Figure 2A-D illustrates the main steps for the preparation of a typical GUV-MLV complex. After the vesicle preparation is completed and the vesicle complex is immobilized on the glass substrate, the microinjection technique is used to deliver small amounts of calcium ions to the outer leaflet of the GUV through an open-tip glass micropipette. The flow of calcium solution out of the tip generates a localized calcium ion gradient at the GUV membrane surface, leading to membrane remodeling and generation of the MTPs. The MTPs are oriented away from the calcium ion source and grow inside the GUV. This MTP formation can be directly monitored using fluorescence microscopy and recorded using a digital camera. Figure 3 shows the experimental setup used for producing the membrane remodeling. The formation of the MTPs (Figure 2E and Figure 4) in this protocol demonstrates a contrasting result to calcium ion exposure experiments performed in bulk volume conditions. Under bulk conditions, the GUVs rupture and form membrane patches that can be observed to adhere to the glass surface25. Further details on the formation of the GUV-MLV complexes, as well as the procedure to perform the microinjection of calcium ions, are explained in this article. The protocols are largely focused on calcium ion microinjection; however, this approach can easily be modified for use in studying the membrane responses due to local exposure to other ions or proteins. Additionally, the composition of the vesicles can be tuned to isolate the lipid component roles in the process of membrane remodeling. The presented protocol does not require any sophisticated equipment to produce the GUV-MLV complexes and is characterized by a high degree of reproducibility. Prepare a solution of lipids SPE/DOPS/ATTO488-DOPE in chloroform with a mass mixing ratio of 79/20/1.The final concentration of lipids in chloroform is 1 mg/mL, and the final mass is 0.6 mg (typically less than 1 mg). Use disposable round bottom glass vials (round bottom glass tubes, 10 x 75 mm) when preparing the lipid solution without a pre-cleaning step. Fill and rinse the glass syringes (25 µL) with chloroform at least 5 times before usage. To fill and rinse the glass syringe at least 5 times, 3-4 mL of chloroform is sufficient. CAUTION: When handling chloroform, use glass syringes and perform all the procedures in a fume hood while wearing appropriate gloves and protective eyewear at all times. Do not use any plastic flasks, syringes, or pipettes when handling chloroform. Wrap the glass vial containing the lipid mixture with metal foil to protect the contents from ambient light and evaporate the solvent in a rotary evaporator for 3 h to remove the chloroform, with the pressure reaching 7 kPa vacuum at 80 rpm. A dry lipid film is formed at the bottom of the glass vial after evaporation (Figure 2A). NOTE: Scaling up several times and using larger amounts of lipids may require longer rotary evaporation time to ensure full removal of chloroform. Slowly add 600 µL of phosphate buffered saline (PBS) buffer solution (pH 7.8, without dilution) on top of the dried lipid film. Following the addition of the buffer, gently add 6 µL of glycerol to protect the sample from complete dehydration during the GUV-MLV formation steps (achieving a final concentration of glycerol of 1 wt%)36. Seal the glass vial using parafilm and cover with metal foil to protect from ambient light. Store in the fridge at 4 °C overnight. NOTE: The PBS buffer solution consists of 0.151 g of Trizma base, 1.592 g of K3PO4, 1.021 g of KH2PO4, 0.062 g of MgSO4 ·7H2O, and 0.0465 g of EDTA in 250 mL of purified water. Store the solution at 4 °C, and warm to room temperature prior to usage. The equivalent amount of 10 mM HEPES buffer can be used instead of PBS solution. The HEPES buffer solution is prepared by diluting a 1 M HEPES stock solution with purified water. The following day, sonicate the glass vial containing the solution for 1 min using an ultrasonication bath at room temperature. Remove the parafilm and pipette until a visually uniform solution of small lipid vesicles is formed (Figure 2B). Aliquot 30 µL of the obtained small lipid vesicle solution into individual 0.5 mL plastic tubes. Keep these stock aliquots at -18 °C for a maximum of 6 months. NOTE: If the small lipid vesicle solution is not visually uniform, vortex the solution 4 times for 1-2 s using a vortex mixer at maximum speed. Thaw to room temperature a plastic tube containing an aliquot of the frozen suspension of small lipid vesicles. Vortex the tube 4 times for 1-2 s using a vortex mixer at maximum speed. Place 5 µL of the small lipid vesicle suspension onto the surface of a glass cover slip (24 x 60 mm) to form a small round droplet. Use a glass cover slip without any pre-cleaning steps. Place the glass cover slip in a vacuum desiccator (<100 kPa vacuum) for 20 min. Store the dried lipid film at room temperature for 4 min, then slowly pipette 50 µL of 10 mM HEPES buffer on top of the dry lipid film for rehydration. Wait 5 min to pre-form the GUV-MLV complexes (Figure 2C). Center a glass cover slip on the microscope stage, then pipette 300 µL of HEPES buffer on it and position the center of the droplet above the objective (Figure 3B). Transfer the 50 µL of the pre-formed GUV-MLV solution into the HEPES solution (300 µL). Wait 25 min to allow sparsely formed GUV-MLV complexes to firmly adhere to the surface of the glass cover slip (Figure 2D). NOTE: Occasionally, the GUV-MLV complexes do not form on the glass cover slip and instead lipid patches or only MLVs are observed. This can be explained by accidental shaking of the sample during steps 2.4 or 2.6, or numerous freeze-thaw cycles of the small vesicle suspension. Repeat steps 2.1-2.6 or use freshly prepared lipid stock solution (step 1.1) to obtain the GUV-MLV complexes. Round the edges of the borosilicate glass capillaries by gently placing the capillary ends into the flame of a candle to prevent the micropipette from being broken while attaching it to the micropipette holder. Pull at least 3 glass capillaries using an automatic laser puller using the program set: Heat = 400, Fil = 4, Vel = 50, Del = 225, Pul = ; Heat = 400, Fil = 4, Vel = 60, Del = 150, Pul = 120. The program set must be entered with the first value of Pul left blank. Using borosilicate glass capillaries of inner diameter (I.D.) 1.00 mm and outer diameter (O.D.) 0.78 mm results in a micropipette with a tip opening of approximately 0.3 µm in diameter. Back-fill each micropipette with 8 µL of 5 mM CaCl2 solution in HEPES buffer (10 mM) using a microloader. Filter the CaCl2 solution using a 0.2-0.5 µm syringe filter prior to usage to avoid clogging of the pipette tip. NOTE: Ensure that the CaCl2 is completely dissolved in the HEPES buffer solution, which is also used for steps 2.4-2.6. Connect a micropipette holder to a micromanipulator. Mount the micropipette into the micropipette holder tightly. Connect the injection pump and capillary holder using the supply tube. Start the injection pump. Adjust the settings on the injection pump to 20 hPa (injection pressure) and set a 5 hPa compensation pressure, on automatic mode. Pause the injection pump until the micropipette is ready for the microinjection. Set the microscope to brightfield mode. Configure it for differential interference contrast (DIC). Use 63X or 100X high NA (1.3) objectives to achieve the optimal membrane edge resolution. Use the coarse micromanipulator to position the micropipette above the droplet containing the GUV-MLV complexes. Locate the tip of the micropipette above the objective. Focus the microscope on the midpoint of the GUV-MLV complex and then refocus approximately 50 µm above the GUV. Use the coarse mode of the micromanipulator to gently bring the micropipette into focus. Switch the micromanipulator to the fine mode. Slowly refocus to the GUV surface while translating the micropipette tip down and keeping the tip in focus. Position the micropipette tip approximately 20 µm from the GUV surface. If the micropipette tip is broken due to accidental contact with the glass cover slip (example in Figure 5B), replace it immediately to avoid unnecessary calcium ion release into the sample bulk solution. Set the microscope into fluorescence mode. Set dichroics to excite at 488 nm and detect the emission at 505-550 nm. Switch on the injection pump and start the calcium ion injection. Use the fine mode of the micromanipulator, and slowly approach the GUV with the micropipette tip. Position the micropipette tip at a distance of 3 µm from the membrane surface while injecting the CaCl2 solution from the micropipette to allow MTPs to form (Figure 4). To translate the MTPs along the GUV surface, slowly move the pipette tip (with a velocity of 0.1-0.3 µm/s) around the GUV surface using the fine micromanipulator (Figure 6). Maintain approximately the same distance (3 µm) between the GUV surface and the micropipette tip while continuing the calcium ion injection. NOTE: At high translation rates of the micropipette tip (above 0.7 µm/s), the MTPs will not migrate in sync with the micropipette. Instead, they will scatter and shorten, while new MTPs will be formed at the new location of the micropipette tip (Figure 7). To stop the microinjection, turn off the injection pump and move the micropipette away from the GUV surface. In this work, we demonstrate the creation of GUV-MLV complexes and how they can be used to elucidate the effect of calcium ion gradients on cell membrane dynamics. Surface-attached GUV-MLV complexes are required for these experiments to allow for a fixed cell-sized mimic while establishing an ion gradient through microinjection. The GUV membrane responds to localized calcium concentration through formation of MTPs directed away from the calcium ion source. Furthermore, the MTPs can be translated around the GUV in a contactless manner by moving the micropipette tip around the membrane surface. A schematic illustration of the GUV-MLV preparation procedure is shown in Figure 2. Although in the presented protocol, the GUV-MLV complexes are already pre-formed during step 2.4 (Figure 2C), transferring the vesicle solution to another 300 µL droplet of buffer (step 2.6 of the protocol) allows the sparsely formed GUV-MLV complexes to sufficiently adhere to the glass substrate. In this way, a suitable complex for micromanipulation and microinjection is established (Figure 2D). Occasionally, the GUVs contain one or several entrapped lipid vesicles, which do not affect the MTP formation, as shown in Figure 4A. These GUVs produce MTPs; however, the imaging may be obstructed if the entrapped vesicles are large. The majority of the prepared GUVs (up to 75%) appear hemispherical and are attached to the MLVs, as shown in Figure 1A. These vesicles are the main focus of this protocol and are suitable for the microinjection procedure. About 25% of the remaining GUVs appear undulating (Figure 1B), which is indicative of a lower membrane tension regime. These undulating vesicles also allow for the formation of the tubular protrusions; however, they exhibit different kinetics and a different morphology of the formed MTPs, which is beyond the scope of this protocol25. The typical diameter of the prepared vesicles varies between 2 to 15 µm for the MLVs, and between 2 to 40 µm for the GUVs. The optimal GUV size for the exposure to calcium ions is 5 µm or larger. Micropipettes have been used in singe-cell interrogation schemes as well as in procedures requiring manipulation of synthetic GUVs for several decades37,38. The majority of these applications involved direct physical contact between the micropipette and the surface of cells or vesicles. Examples include the patch-clamp technique or pulling membrane tethers from the GUV membrane, in addition to building nanotube-vesicle networks23,28,39. Recently, micropipettes have also been used to generate localized gradients of ions and molecules around GUVs to reconstruct heterogeneous cell microenvironments24,25. In the presented protocol, a properly functioning micropipette (Figure 5A) is a crucial factor for establishing a calcium ion gradient at the GUV surface by releasing the solution contained within. Proper positioning of the micropipette at the GUV surface and avoiding contact with the lipid membrane are essential for successful microinjection. The micropipette tip is held at a distance of approximately 3 µm from the GUV surface, which is an optimal distance to generate MTPs while mimicking variations of calcium near the cell membrane. If the micropipette tip is accidently broken (Figure 5B), a replacement is required. The previously tested concentration range of CaCl2 inside the micropipette, which allows for the MTP formation, is between 2 and 5 mM25, which corresponds to extracellular calcium concentrations. At lower CaCl2 concentrations, i.e., 1 mM, no MTPs are observed. The formation of MTPs upon the calcium microinjection begins with the formation of small membrane invaginations, which grow into MTPs at the site of the exposure (Figure 4B). The MTPs continue to grow as long as the GUV membrane remains exposed to the calcium ions. They fluctuate and point away from the calcium ion source (Figure 4C, Supplementary Movie 1). When the calcium ion supply is terminated, the MTPs scatter over the GUV surface, making it difficult to conclude whether the MTPs remain or eventually disappear. The formation of MTPs can be explained by localized calcium ion binding to the exposed outer leaflet of the GUV membrane and triggering spontaneous curvature (m), which is directly associated with the formation of spontaneous tension σ = 2κm2 (κ is the bending rigidity), that induce bending of the membrane and forming inward MTPs. Previous reports have demonstrated that deformation of the membrane can be explained by condensation and/or clustering of the negatively charged lipids upon binding of the calcium ions to the membrane, resulting in negative spontaneous curvature40. Alternatively, the strong binding of Ca2+ to the surface of the negatively charged bilayer neutralizes the surface charge density of the exposed lipid bilayer leaflet. This leads to the charge density difference across the bilayer, resulting in nonzero spontaneous curvature, sufficient to bend membrane25. The observed formation of MTPs demonstrates a sensitivity of lipid membranes to calcium ions and offers a novel contactless approach for producing membrane tubular structures. Elucidating the origin of this membrane tubulation can be important for understanding the dynamics of membrane shape transitioning during various cell functions and cell reshaping and can be helpful for gaining insights into lipid organization within cell membranes. The observed MTPs are always generated at the site on the membrane undergoing calcium ion exposure. Thus, by choosing the location of the micropipette tip, it is possible to define the area of the GUV surface for the protrusion growth. Next, if the micropipette is slowly (0.1-0.3 µm/s) moved around the GUV surface, while maintaining the separation distance from the membrane, the MTPs are translated in tandem with the micropipette. Figure 6 and the corresponding Supplementary Movie 2 demonstrate such migration of the MTPs around the GUV surface. This process is likely to be accompanied by the formation of new MTPs upon continuous calcium ion injection25. At high translation rates (above 0.7 µm/s), the MTPs are not able to follow the micropipette tip. Instead, new protrusions are formed at the new location of the micropipette tip (Figure 7). The observed contactless calcium ion-guided translation of MTPs around the GUV surface can further our understanding of the driving forces behind the dynamics of membrane tubular structures inside cells. Moreover, this approach offers a novel contactless mode for controlling the transport of material in soft matter systems by using chemical gradients. Figure 1: Representative fluorescent microscopy images of GUV-MLV complexes immobilized on the surface of a glass cover slip. (A). Example of a spherical GUV. The GUV appears in the form of a hemisphere attached to the MLV. (B). Example of an undulating GUV. The black arrows indicate the deformed areas of the membrane. The images are enhanced and inverted to improve the visualization of the fluorescently labeled GUV membranes. The scale bar represents 5 µm. Please click here to view a larger version of this figure. Figure 2: Schematic illustrations of the GUV-MLV preparation and the microinjection schemes. (A). A dry lipid layer is formed at the bottom of the glass vial as a result of the rotary evaporation of chloroform from the lipid solution. (B). The rehydrated lipid layer is sonicated, and small lipid vesicles are formed. (C). A small droplet of the vesicle solution (5 µL) is placed on the surface of a glass cover slip and transferred into a desiccator for 20 min to dehydrate the lipid solution and form a dry lipid film (this step is not shown). Rehydrating the dry lipid film with 50 µL of buffer solution produces the pre-formed GUV-MLV complexes. (D). The transfer of the pre-formed complexes to a larger volume of buffer results in the formation of sparsely separated GUV-MLVs attached to the surface of the glass cover slip. (E). Positioning the micropipette near the surface of the GUV and releasing the calcium ions triggers the formation of MTPs. The illustrations are not drawn to scale. Please click here to view a larger version of this figure. Figure 3: Experimental setup for the microinjection of calcium ions. (A). The components of the experimental setup required to generate the MTPs in the GUVs. (B). Details of the microinjection setup. The glass coverslip with the solution of the GUV-MLV complexes placed on the microscope stage. The angle between the micropipette and the surface of the glass cover slip is 30° (marked in white). Please click here to view a larger version of this figure. Figure 4: Formation of MTPs upon the microinjection of the calcium ions at the surface of the GUV. (A). The GUV-MLV complex prior to exposure to a calcium ion gradient. The arrow indicates a lipid vesicle entrapped inside the GUV, and which does not obstruct the observation of the MTPs. (B). Small MTPs are formed upon the microinjection of calcium ions (5 mM concentration of CaCl2 in the micropipette). (C). Growth of the MTPs upon continuous exposure to calcium ions. The fluorescence images are enhanced and inverted for visualization purposes. The scale bar represents 5 µm. Please click here to view a larger version of this figure. Figure 5: Glass micropipettes used for calcium ion microinjection. (A). An example of a properly functioning micropipette. (B). An example of a micropipette that has a broken tip (the damaged area is indicated with a black arrow). Both images are enhanced and inverted for better visualization. The scale bar represents 5 µm. Please click here to view a larger version of this figure. Figure 6: Calcium ion-guided translation of the MTPs around the surface of the GUV. (A). The MTPs are formed at the GUV surface upon microinjection of 5 mM CaCl2 solution. (B-C). Translation of the micropipette tip (0.2-0.3 μm/s) around the membrane surface triggers the movement of the MTPs in the direction of the calcium ion source. The black arrows highlight the direction of the micropipette movement. The images are enhanced and inverted to improve membrane visualization. The scale bar represents 5 µm. Please click here to view a larger version of this figure. Figure 7: MTPs at high translation rate of the micropipette tip. (A). The MTPs are formed at the GUV surface upon the microinjection of the 5 mM CaCl2 solution (white line). (B-C). A high translation rate of the micropipette around the GUV surface (1 μm/s) results in the formation of new MTPs at the new location of the micropipette tip (magenta line), as well as scattering of the previously formed MTPs (white line). Please click here to view a larger version of this figure. Supplementary Movie 1: Formation of MTPs in GUV upon localized exposure to the Ca2+ gradient. Please click here to download this movie. Supplementary Movie 2: Calcium ion-guided MTP migration around the GUV surface. Please click here to download this movie. Biomimetic cell systems allow for the study of membrane behavior upon the exposure to external stimuli such as ions, proteins, or nanoparticles. GUVs, being such a model, can respond to alterations in the chemical environment by adjusting their shape, which often involves the formation of tubular structures and invaginations24,41,42,43. This article offers an approach to generate MTPs in a contactless manner via remodeling of the GUV surface upon localized injection of calcium ions at the GUV surface. The protocol describes the preparation of the GUV-MLV complex, which mimics a cell plasma membrane, as well as how to employ a microinjection technique to generate calcium ion gradients close to the GUV surface to form MTPs. The majority of previous experimental studies that addressed calcium ion-membrane interactions exposed lipid vesicles to bulk calcium ion concentration14,17. Depending on the experimental conditions, such bulk exposure may result in a different membrane response with no tubular protrusions formed25. The formation of the GUV-MLV complexes is rather straightforward and only requires standard laboratory equipment, such as a rotary evaporator, ultrasonic bath, and vacuum desiccator. Still, there are several critical steps to consider during the vesicle preparation. It is important to ensure that the dehydration of the vesicles is complete (during step 2.3 of the protocol) and a dry circular lipid film containing only a small amount of salt crystals is formed on the surface of the glass cover slip. During the experiment, careful handling of the vesicle solution, using fresh lipid stock solution in chloroform as well as fresh HEPES buffer, is essential for successful preparation of the GUV-MLV complexes. Furthermore, secure attachment of the GUV-MLV complex to the glass cover slip surface is crucial for micromanipulation and microinjection. To confirm adequate adhesion of the GUV-MLV complex, the micropipette (without injection flow) can be used to gently push against the GUV surface. A firmly adhered vesicle will not slide along the surface upon direct physical contact. Because the experiments are performed in an open buffer droplet, which may be interrogated for several hours, evaporation must be taken into consideration. Evaporation from the buffer droplet will change the osmotic conditions, which could affect and destabilize the vesicles. To restore osmotic conditions, periodical addition of pure water to the sample to restore the original volume returns the system to homeostasis. When modifying the lipid membrane composition, it is crucial that the vesicles are produced in the form of a GUV-MLV complex because the MLV allows for transferring the lipid material to the GUV during the membrane reshaping. Previous studies have shown that replacing the components of the SPE mixture with pure lipids, or adding 5-30% of cholesterol, also allows for GUV-MLV complex formation28,44. The majority of the prepared GUVs are unilamellar45. Furthermore, when testing other divalent cations, such as magnesium ions, the formation of the MTPs heavily depends on the presence of negatively charged DOPS in the lipid mixture. Without DOPS, the MTPs do not form in the vesicles described in this protocol. Also, monovalent cations, such as potassium and sodium, do not result in the formation of MTPs, even in DOPS-containing vesicles25. In addition to the critical steps with regard to preparation and manipulation of the GUVs, there are several important factors to consider during the microinjection procedure. The successful microinjection of calcium ions heavily relies on properly functioning glass micropipettes, which are prepared on the day of the experiment. There are several factors that could cause the micropipette to malfunction. A common reason is a clogged tip opening. Small lipid particles, which are byproducts of the vesicle preparation, are dispersed in the solution and tend to adhere to the micropipette tip, thereby generating a clogging. Cleaning the pipette tip is best done by lifting it up from the vesicle solution and placing it back close to the GUV surface. The usage of the blow-out function of the microinjection pump must be avoided because it results in massive injection of calcium ions into the bulk solution. Furthermore, small air bubbles entrapped inside the micropipette prevent proper microinjection, in which case the micropipette should be replaced with a new one. Tip breakage can be significantly minimized by placing the experimental setup on a vibration-dampening table to minimize tip oscillations. Furthermore, care needs to be taken when choosing an observation scheme, to minimize photobleaching whilst obtaining the best time-resolved images. Wide-field laser-induced fluorescence microscopy was utilized in this protocol because it allows for a relatively high image acquisition rate at an objective limited probe depth. Furthermore, usage of inverted microscopy allows for simultaneous microinjection and observation of the lipid vesicles and MTPs. One of the main limitations of the presented method is the requirement of extensive manual work and sufficient micromanipulation skills. Because the complexes are formed through a spontaneous swelling process, the size of the GUVs and MLVs cannot be controlled. Additionally, this protocol does not allow for control of the membrane tension of the prepared GUV-MLV complexes, which might be necessary to collect additional details with regard to membrane remodeling. The GUVs are connected to the MLVs with the latter supplying lipid material for the substantial growth of the MTPs to an extent that would be impossible to achieve solely utilizing the membrane available from the GUVs. 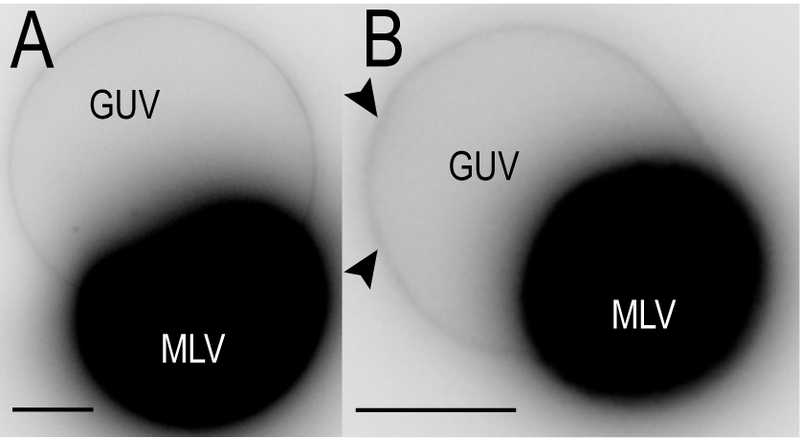 The MLVs also contribute to lowering any lateral surface tension variations within the GUV-MLV complex44, which would complicate the attempts to control the tension of the vesicle by using micropipette aspiration. This GUV-MLV-based model does provide a lower tension that better mimics the tension regimes found in cellular membrane structures connected to membrane reservoirs, such as membrane folds and invaginations46. At the same time, the micropipette aspiration technique can be successfully applied to control membrane tension in single GUVs. For example, the work by Graber et al. provided details on the formation of membrane tubular invaginations in single GUVs upon binding of calcium ions to the membrane at bulk conditions from varied tension regimes40. Finally, the comparison of the membrane behavior at both local and bulk exposure to calcium requires improved control of the membrane adhesion to the surface, which is beyond the scope of this protocol. To summarize, the proposed technique allows for contactless membrane remodeling and formation of MTPs upon localized stimulation with calcium ions. Future applications of this method center on the translation from synthetic vesicle systems to native biological membranes, such as cell blebs. The proposed method can be incorporated with other single-cell interrogation schemes, such as patch-clamp or microelectrode amperometry, or combined with localized heating strategies31,47,48. Testing the effect of other ions or molecules is straightforward and involves simply replacing the calcium ions with the molecules of interest. Furthermore, complex synthetic lipid vesicles can be produced through membrane functionalization with transmembrane proteins, which may expand our understanding of the biophysics of cell reshaping and cell membrane dynamics associated with sensing of local chemical gradients. Last but not least, contactless stimulation of the lipid membrane can also be translated to polymeric soft matter systems, offering a basis for a novel contactless manipulation platform. Monteith, G. R., McAndrew, D., Faddy, H. M., Roberts-Thomson, S. J. Calcium and cancer: Targeting Ca2+ transport. Nature Reviews Cancer. 7, (7), 519-530 (2007). Meldolesi, J., Pozzan, T. The endoplasmic reticulum Ca2+ store: A view from the lumen. Trends in Biochemical Science. 23, (1), 10-14 (1998). Bygrave, F. L., Benedetti, A. What is the concentration of calcium ions in the endoplasmic reticulum? Cell Calcium. 19, (6), 547-551 (1996). Mogami, H., Tepikin, A. V., Petersen, O. H. Termination of cytosolic Ca2+ signals: Ca2+ reuptake into intracellular stores is regulated by the free Ca2+ concentration in the store lumen. The EMBO Journal. 17, (2), 435-442 (1998). SantoDomingo, J., et al. Calcium dynamics in bovine adrenal medulla chromaffin cell secretory granules. European Journal of Neuroscience. 28, (7), 1265-1274 (2008). Moreno, A., et al. Calcium dynamics in catecholamine-containing secretory vesicles. Cell Calcium. 37, (6), 555-564 (2005). Bulenda, D., Gratzl, M. Matrix free Ca2+ in isolated chromaffin vesicles. Biochemistry. 24, (26), 7760-7765 (1985). Montero, M., et al. Chromaffin-cell stimulation triggers fast millimolar mitochondrial Ca2+ transients that modulate secretion. Nature Cell Biology. 2, (2), 57-61 (2000). Villalobos, C., et al. Redistribution of Ca2+ among cytosol and organella during stimulation of bovine chromaffin cells. The FASEB Journal. 16, (3), 343-353 (2002). Brown, E. M., Hofer, A. M. Extracellular calcium sensing and signalling. Nature Reviews Molecular Cell Biology. 4, (7), 530-538 (2003). Tarafdar, P. K., Chakraborty, H., Dennison, S. M., Lentz, B. R. Phosphatidylserine inhibits and calcium promotes model membrane fusion. Biophysical Journal. 103, (9), 1880-1889 (2012). Boettcher, J. M., et al. Atomic view of calcium-induced clustering of phosphatidylserine in mixed lipid bilayers. Biochemistry. 50, 2264-2273 (2011). Binder, H., Zschörnig, O. The effect of metal cations on the phase behavior and hydration characteristics of phospholipid membranes. Chemistry and Physics of Lipids. 115, 39-61 (2002). Sinn, C. G., Antonietti, M., Dimova, R. Binding of calcium to phosphatidylcholine-phosphatidylserine membranes. Colloids and Surfaces A: Physicochemical and Engineering Aspects. 282-283, 410-419 (2006). Pedersen, U. R., Leidy, C., Westh, P., Peters, G. N. H. The effect of calcium on the properties of charged phospholipid bilayers. Biochimica et Biophysica Acta. 573-582 (2006). Melcrova, A., et al. The complex nature of calcium cation interactions with phospholipid bilayers. Scientific Reports. 6, 38035 (2016). Roux, M., Bloom, M. Ca2+, Mg2+, Li+, Na+, and K+ distributions in the headgroup region of binary membranes of phosphatidylcholine and phosphatidylserine as seen by deuterium NMR. Biochemistry. 29, (30), 7077-7089 (1990). Waldbillig, R. C., Robertson, J. D., McIntosh, T. J. Images of divalent cations in unstained symmetric and asymmetric lipid bilayers. Biochimica et Biophysica Act. 448, (1), 1-14 (1976). Kay, J. G., Koivusalo, M., Ma, X., Wohland, T., Grinstein, S. Phosphatidylserine dynamics in cellular membranes. Molecular Biology of the Cell. 23, 2198-2212 (2012). Vernier, P. T., et al. Nanopore formation and phosphatidylserine externalization in a phospholipid bilayer at high transmembrane potential. Journal of the American Chemical Society. 128, 6288-6289 (2006). Moscho, A., Orwar, O., Chiu, D. T., Modi, B. P., Zare, R. N. Rapid Preparation of Giant Unilamellar Vesicles. Proceedings of the National Academy of Sciences of the United States of America. 93, (21), 11443-11447 (1996). Walde, P., Cosentino, K., Engel, H., Stano, P. Giant Vesicles: Preparations and Applications. ChemBioChem. 11, (7), 848-865 (2010). Garten, M., Aimon, S., Bassereau, P., Toombes, G. E. S. Reconstitution of a Transmembrane Protein, the Voltage-gated Ion Channel, KvAP, into Giant Unilamellar Vesicles for Microscopy and Patch Clamp Studies. Journal of Visualized Experiments. (95), e52281 (2015). Khalifat, N., Puff, N., Bonneau, S., Fournier, J. B., Angelova, M. I. Membrane deformation under local pH gradient: mimicking mitochondrial cristae dynamics. Biophysical Journal. 95, 4924-4933 (2008). Ali Doosti, B., et al. Membrane Tubulation in Lipid Vesicles Triggered by the Local Application of Calcium Ions. Langmuir. 33, (41), 11010-11017 (2017). Barber, M. A. A Technic for the Inoculation of Bacteria and Other Substances into Living Cells. The Journal of Infectious Diseases. 8, (3), 348-360 (1911). Taylor, C. V. An accurately controllable micropipette. Science. 1329, 617-618 (1920). Jesorka, A., et al. Generation of phospholipid vesicle-nanotube networks and transport of molecules therein. Nature Protocols. 6, (6), 791-805 (2011). Lobovkina, T., et al. Mechanical tweezer action by self-tightening knots in surfactant nanotubes. Proceedings of the National Academy of Sciences of the United States of America. 101, 7949-7953 (2004). Karlsson, A., et al. Networks of nanotubes and containers. Nature. 409, (6817), 150 (2001). Wegrzyn, I., et al. 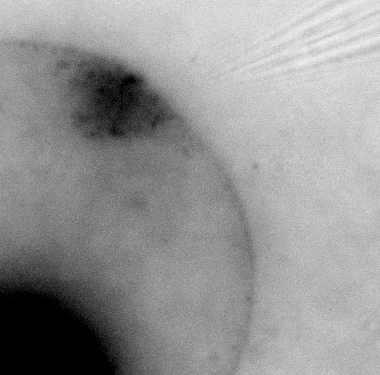 Membrane protrusion coarsening and nanotubulation within giant unilamellar vesicles. Journal of the American Chemical Society. 133, 18046-18049 (2011). Mellander, L. J., et al. Two modes of exocytosis in an artificial cell. Scientific Reports. 4, (2014). Cans, A. S., et al. Artificial Cells: Unique Insights into Exocytosis Using Liposomes and Lipid Nanotubes. Proceedings of the National Academy of Sciences of the United States of America. 100, (2), 400-404 (2003). Hampton, M. B., Vanags, D. M., Isabella Pörn-Ares, M., Orrenius, S. Involvement of extracellular calcium in phosphatidylserine exposure during apoptosis. FEBS Letters. 399, (3), 277-282 (1996). Criado, M., Keller, B. U. A membrane fusion strategy for single-channel recordings of membranes usually non-accessible to patch-clamp pipette electrodes. FEBS Letters. 224, 172-176 (1987). Duzgunes, N. Methods in Enzymology. Liposomes Part F. Elsevier Science. (2009). Hamill, O. P., Marty, A., Neher, E., Sakmann, B., Sigworth, F. J. Improved patch-clamp techniques for high-resolution current recording from cells and cell-free membrane patches. Pflügers Archiv European Journal of Physiology. 391, (2), 85-100 (1981). Orwar, O., et al. Patch-Clamp Detection of Neurotransmitters in Capillary Electrophoresis. Science. 272, (5269), 1779-1782 (1996). Pevost, C., Tsai, F. C., Bassereau, P., Simunovic, M. Pulling Membrane Nanotubes from Giant Unilamellar Vesicles. Journal of Visualized Experiments. (130), e56086 (2017). Graber, Z. T., Shi, Z., Baumgart, T. Cations induce shape remodeling of negatively charged phospholipid membranes. Physical Chemistry Chemical Physics. 19, (23), 15285-15295 (2017). Pezeshkian, W., et al. Mechanism of Shiga Toxin Clustering on Membranes. ACS Nano. 11, (1), 314-324 (2017). Angelova, M. I., Tsoneva, I. Interactions of DNA with giant liposomes. Chemistry and Physics of Lipids. 101, (1), 123-137 (1999). Liu, Y. G., Agudo-Canalejo, J., Grafmuller, A., Dimova, R., Lipowsky, R. Patterns of Flexible Nanotubes Formed by Liquid-Ordered and Liquid-Disordered Membranes. ACS Nano. 10, (1), 463-474 (2016). Stepanyants, N., Jeffries, G. D. M., Orwar, O., Jesorka, A. Radial Sizing of Lipid Nanotubes Using Membrane Displacement Analysis. Nano Letters. 12, (3), 1372-1378 (2012). Billerit, C., et al. 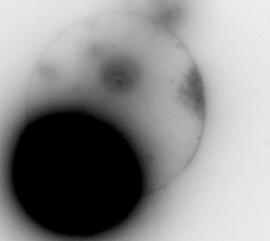 Heat-induced formation of single giant unilamellar vesicles. Soft Matter. (20), (2011). Gauthier, N. C., Fardin, M. A., Roca-Cusachs, P., Sheetz, M. P. Temporary increase in plasma membrane tension coordinates the activation of exocytosis and contraction during cell spreading. Proceedings of the National Academy of Sciences of the United States of America. 108, (35), 14467-14472 (2011). Garten, M., et al. Whole-GUV patch-clamping. Proceedings of the National Academy of Sciences of the United States of America. 114, (2), 328-333 (2017). Messina, P., et al. Monitoring and Quantifying the Passive Transport of Molecules Through Patch-Clamp Suspended Real and Model Cell Membranes. Angewandte Chemie International Edition. 126, (12), 3256 (2014).